The Village of Olympia Fields wanted to upgrade the out dated lighting at a busy Metra Train Station and surrounding street lighting to ensure the surrounding area was safe for passengers, Metra staff and community members. Verde Solutions was able to replace all the existing lighting equipment with retrofit kits which allowed Olympia Fields to take advantage of a 10-year warranty saving additional money. 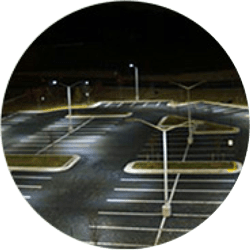 In addition to the reduction of energy usage, LED lighting in public spaces increasing visibility, reducing crime, creates greater eye appeal and boasts a longer product life span. Based on the conversion rates and usage by the Environmental Protection Agency, your net reduction of 84,254 kWh would provide the following equivalent environmental benefits EACH YEAR.